We pick up the story of Ron Burgundy (Will Ferrell) a few years after the first movie ends. Ron and Veronica (Christina Applegate) are now married and have a son, Walter (Judah Nelson). They are living in New York, co-hosting the news. That is when the bottom falls out. Ron hits rock bottom. He now hosts a show at Sea World. He fails miserably at his new job. He is approached by Freddie Shapp (Dylan Baker), who offers Ron a position at GNN, the first ever 24 hour news station. Ron accepts the job, with one condition: he gets to choose his news crew. Ron begins his quest to round up his old crew, Champ Kind (David Koechner), Brian Fantana (Paul Rudd), and Brick Tamland (Steve Carell). With the team back together, they take their graveyard shift and present the news as only they can. With the pressure to fill the time with news, Ron and his gang find a way to revolutionize the world of news. Will it be enough for Ron to get his life back together, especially with arch-rival Jack Lime (James Marsden) trying to stop him at every turn? I have to admit, I was never a huge fan of the original Anchorman. It was okay, but I’m not one of those who loved it. The problem with Anchorman 2, is the same problem that most films of this nature find themselves in: they try to hard to outdo the first. And fail miserably. To be fair, I saw the original PG-13 theatrical release. Maybe things are better in the re-released R-rated version. But I doubt it. Will Ferrell, whose spray-tanned Ron Burgundy looks terrible in high-def, carries on in typical Will Ferrell style, only more exaggerated. Will has proven he can hang with the best comedians. As i said, he’s just trying too hard. Christina Applegate and Paul Rudd, both very talented, are sadly underused in the movie. The tension between Ron and Veronica, which gave Anchorman the edge it had, is completely missing. Paul Rudd is wasted in this movie. I expect more from him. The one saving grace from this mess of a film is Steve Carrell. He alone provides the only comedy in the movie that works. His not-the-sharpest-tool-in-the-shed Brick Tamland carries the film. The only times I was laughing were during his scenes. Sadly, though, this isn’t enough to carry the movie. As to be expected, there are a fair share of “surprise” cameos in the film. There was one I was expecting/hoping for. I wasn’t let down. I won’t spoil the surprise for you. I hate when people do that. 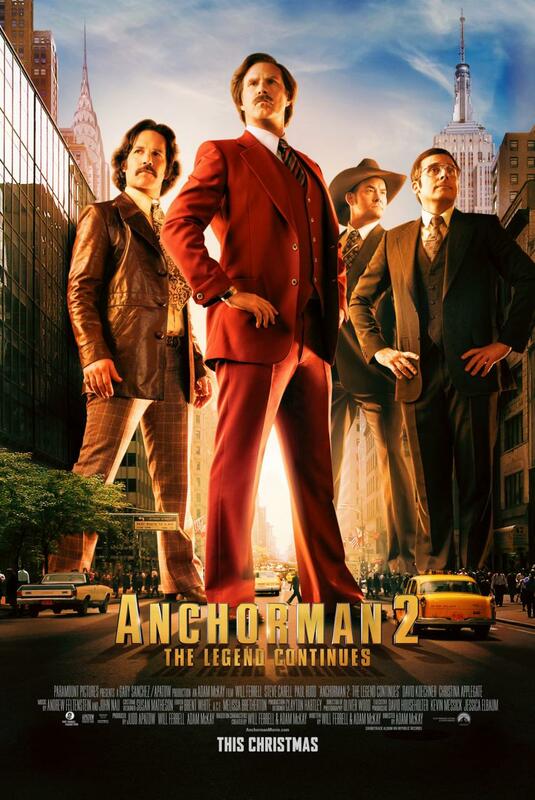 This movie is aimed at one particular group of people: Those who loved Anchorman: The Legend of Ron Burgundy. If you don’t fall into that group, save your time and skip Anchorman 2.